Attorney and Judge Vaino Hassan Spencer was born in Los Angeles, California, on July 22, 1920 to Abdul and Eddie Taylor Hassan. She graduated from Los Angeles Polytechnic High School in 1938. In 1949, she received an associate of arts degree from Los Angeles City College. Spencer earned a bachelor of laws degree from Southwestern School of Law in Los Angeles in 1952. At the age of 32 she passed the California Bar in the same year, the third African American woman admitted to the State Bar. She worked as a general practice attorney and served on various appointive boards and commissions. Spencer also quickly became involved in state politics. She was a member of the California Democratic Central Committee from 1958 to 1960. In 1961, Democrat Governor Edmund G. ”Pat” Brown appointed her Municipal Court judge for the Los Angeles Judicial District. 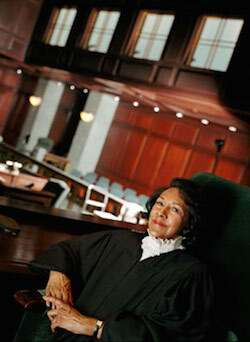 Spencer was the first African American woman to serve on the bench in California and the third black female judge in the history of the United States. She presided over court and jury trials in civil, criminal, and traffic cases. Spencer devoted some of her time to legal and civil rights activities in the 1960s. She served on the California Attorney General’s Committee on Constitutional Rights, was a member of the life membership committee of the National Association for the Advancement of Colored People (NAACP), and served on the board of directors of the National Committee Against Discrimination in Housing. In 1976, California Democratic Governor Edmund “Jerry” Brown appointed Spencer Los Angeles County Superior Court Judge. She was assigned to civil and criminal cases and juvenile and family law matters. Three years later, in 1979, Spencer and California Judge Joan Dempsey Klein met with bar leaders and judges in different parts of the country and talked with them about the absence of women as attorneys and judges in the courtroom. At that time 15 states did not have a woman judge and the federal court system had only 28 female judges. Spencer and Klein established the National Association of Women Judges and held the first conference of the Association in Los Angeles in 1979. The Association pledged to increase the number of women in state and national judiciaries. In 1980, Spencer began serving as Presiding Judge of the Division One California Court of Appeal, Second Appellate District, a position she held for over 20 years. She also belonged to numerous judicial and law oriented organizations. Among them were the Los Angeles County Commission on Justice, California Law Revision Commission, and the National Judicial Council. Spencer won many honors for her work. In 1985, she got the Trailblazer Award from the National Association of Business and Professional Women and received the Lifetime Achievement Award from the National Bar Association in 1991. In 1996, Southwestern Law School gave her an honorary Doctor of Laws degree. Vaino Hassan Spencer retired in September of 2007, after a 46-year career on the bench in California. She died in Los Angeles on October 25, 2016, at the age of 96. Jesse Carney Smith, “Vaino Hassan Spencer," in Notable Black American Women, Book 2, ed. Jesse Carney Smith (New York: Gale Research, 1996); Southwestern Law School, News Release, “Pioneering Alumna Vaino Spencer Retires from the Bench,” October 17, 2007, www.swlaw.edu; Fred Strebeigh, Equal: Women Reshape American Law (New York: W.W. Norton, 2009); Yussuf Simmonds, “African American Women Appeal Court Justices,” Los Angeles Sentinel, March 29, 2012; John M. Langston Bar Association of Los Angeles, “We’ve Lost a Legal Legend: Judge Vaino Hassan Spencer,” October 26, 2016, www.langstonbar.org. Los Angeles Sentinel, March 29, 2012; John M. Langston Bar Association of Los Angeles, “We’ve Lost a Legal Legend: Judge Vaino Hassan Spencer,” October 26, 2016, www.langstonbar.org.